Versace chenille hoodie with Medusa embossed back. 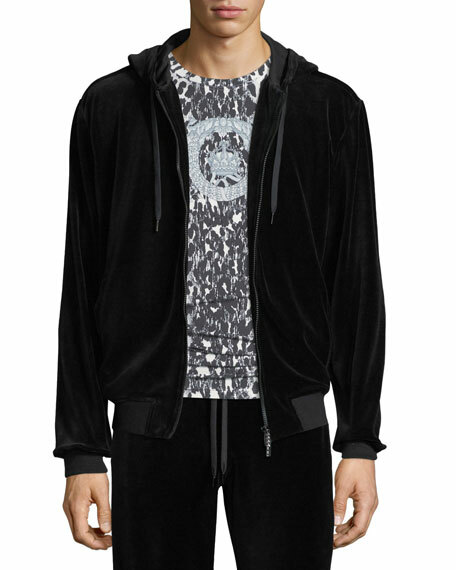 Versace sweat jacket in iconic Greca key trim. Drawstring hooded neckline; zip front. Long sleeves. Side slip pockets. Relaxed fit. Versace sweat jacket in iconic Greca key trim. Drawstring hooded neckline; zip front. Long sleeves. Side slip pockets. Relaxed fit. Straight hem. Modal/spandex; polyester lining. Cotton/spandex trim. Made in Italy. Model's measurements: Height 6'1"/185cm, waist 32"/81cm, typically wears size M.
Versace hoodie in signature baroque scroll pattern. Drawstring, hooded neckline; zip front. Side slip pockets. Straight hem. Polyester. Made in Italy. 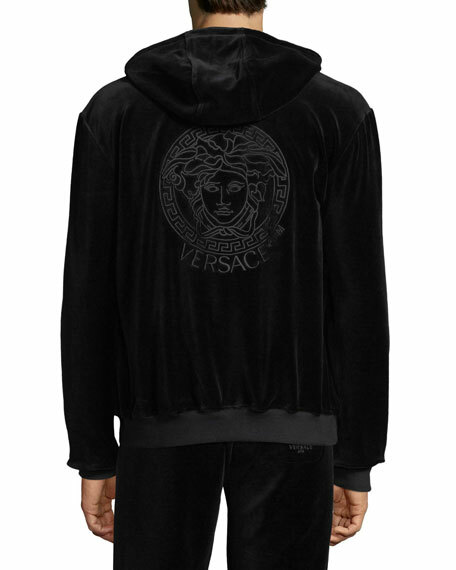 Model's measurements: Height 6'1"/185cm, waist 32"/81cm, typically wears size M.
Versace "Dionysus" sweatshirt with metallic Medusa head graphic print on front. Crew neckline. Raglan sleeves. Banded cuffs and hem. Pullover style. Polyester/spandex. Polyester trim. Made in Italy. 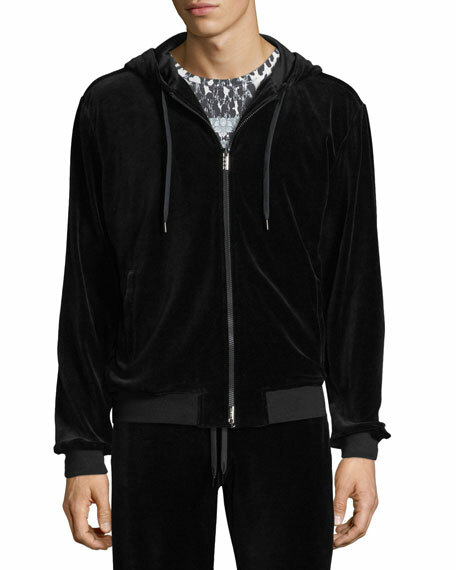 Model's measurements: Height 6'1"/185cm, waist 32"/81cm, typically wears size M.
Versace hoodie in embossed logo knit. Drawstring, hooded neckline; zip front. Side slip pockets. Straight hem. Cotton. Made in Italy.